Last night, a Palestinian driver intentionally drove his van into three soldiers south of Jerusalem. One was critically injured, two a bit more moderately wounded. It was the end of a very bad day in Israel. Late last night, I saw a post on Facebook saying that Jerusalem was moving cement blocks into place to protect the waiting areas along the train route. This won’t save someone if they are on the tracks crossing from one side to the other – as happens at every stop between trains. A person can’t outrun a car and so far, of the 20 or so people who have been injured, and the two who were killed – only a few might have been saved by these cement blocks.The police can’t prevent a car from driving on to the train tracks because the train tracks were built by widening existing roads and then cutting off the extra areas for the train, or by making the road itself shorter. The trains are somewhat coordinated with the street lights and so at many major intersections, the trains cross the road, and the cars pass the train tracks…I even saw a police car once intentionally use the train tracks to bypass a traffic jam. Last night as I rode the train home, as we came to the stop where yesterday’s attack too place, people spoke quietly, all eyes looking around. There are many more border guards on the trains. Soldiers who may be traveling to or from base are holding their guns a bit differently, hands a bit closer to the trigger. There seem to be less Arabs on the train – today only one person got on at the Damascus Gate stop. This stop borders an Arab neighborhood. It was there that the train was hit by a rock on one trip I took; there that an Arab sprayed tear gas into the train on another. It is there that the light rail guards wear armored vests, and interestingly enough, it was there that the city did NOT put cement blocks. 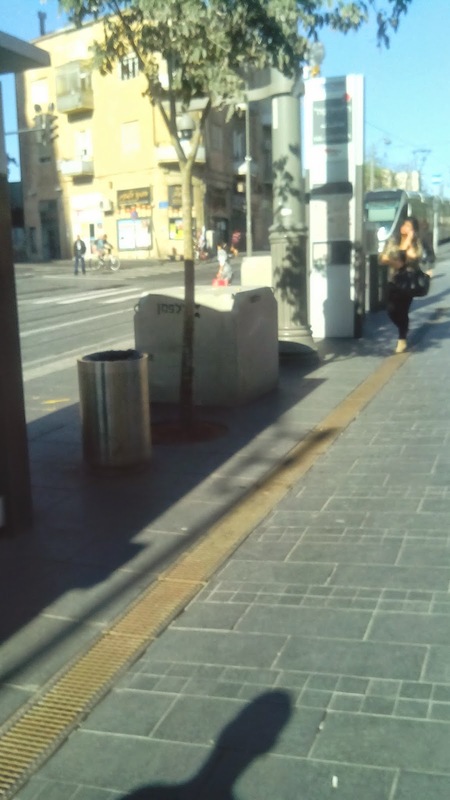 Few Israeli Jews wait at that stop – mostly, it is Arabs and tourists. The blocks are placed where a driver could steer a car into pedestrians…they are huge and ugly. Perhaps if they remain, someone will paint pretty scenes on them but they will never be a “normal” sight. They were put down in the middle of the night, a desperate attempt to stop any more misery from befalling this city. We lost a 3-month-old baby – and if that wasn’t enough, one whose parents struggled 13 long years to conceive. We lost a member of the Border Guard – and if that wasn’t enough, he leaves behind a three year old son, a pregnant wife nearing her due date, bereaved family and friends. And they, these two angels murdered by devils, leave a city on guard and just so sad, so angry, so disgusted. We are tired, we are furious. We want this to end. And the key to this ending rests with us, not with them. They will continue; we can stop it. Well, let’s grab the momentum and take away their power to threaten. Today, I call upon the Prime Minister of Israel, the Mayor of Jerusalem – today, call it. And, once you call it, take the action to end it. Reroute the trains so that it does not go through Shuafat to be stoned and firebombed. Put up a checkpoint between Shuafat and neighboring Jewish neighborhoods so that no MORE cars can drive from Shuafat directly into the heart of Jerusalem and into the bodies of its residents. Announce that just as Muslims can pray anywhere, so too can Jews. No one would stop an unarmed Muslim from walking up to the Kotel, the Western Wall. And he could pray to his Allah all he wants. At most, guards would watch him – no one would warn him not to pray, no one would warn him not to close his eyes and whisper. No one would even stop him if he got on his knees and turned his rear to the Kotel to pray to Mecca. People wouldn’t like it, but they wouldn’t stop him, wouldn’t beat him, throw stones at him and he sure as heck wouldn’t be arrested. His right is ours – we have the right to go up to the Temple Mount. We have the right to pray there, for God’s sake. Who came up with this STUPID idea that the mere sight of a Jew quietly and respectfully whispering a prayer to God is a criminal offense equivalent to inciting a riot (for that would be the result of the Jew’s action). An Israeli police car drives beside light train to guard it from Palestinian stone throwers. The Third Intifada, the one they are waging now, will be the last – that has to be the message of the State of Israel, the Jewish state of Israel. If Netanyahu is going to insist that the Palestinians recognize Israel as a Jewish State, THE Jewish State, it is time that Bibi recognizes it too. If there is a problem with a Jew praying – it is the problem of those who watch and riot, those who are so intolerant that they are driven to violence by the mere thought that a Jew might pray up there on that site that is most holy to us. So, this is the Third Intifada – step one. Step two: Jews have a right, historical, political, ethical, moral – to pray on the Temple Mount. If that bothers the Arabs, they have the right to close their eyes or leave. They will no longer have the right to attack simply because in that holy place, we demand our right to pray. We are not trying to take it over; we are not trying to destroy what they built upon the ruins of our holy place. That may be their way, it isn’t ours…at least not yet. Given the choice, we will live with them; pushed to the edge by violence and terror, we will get to the decision to live without them. Starting tomorrow morning, we must begin to fight the Third Intifada…and we can only fight it once we recognize it and accept it. Next Palestine – Obama Confronts Embarrassing About Face. Coming to a bus/train station near you – terror attack by car has already happened in Canada. The truth is MOST haven’t realised it yet.